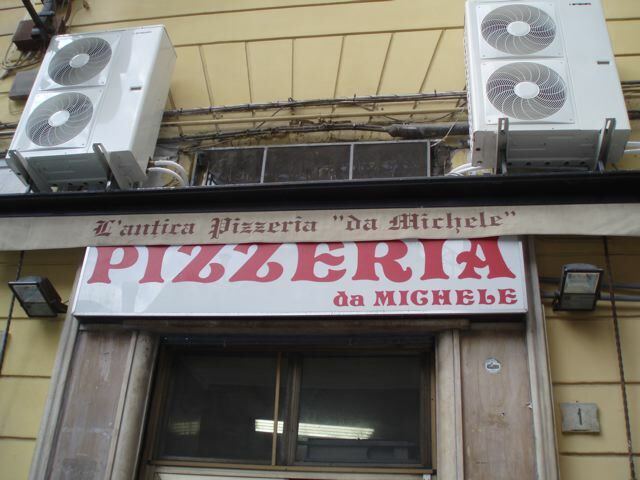 When asked for directions to Da Michele, one of Naples’ most famous pizzerias, the hotel concierge told us, “I would not go there,” implying that it was not in a good neighborhood. Of course, we went anyway. True, the neighborhood was run down, but outside the restaurant there were late model Mercedes’ and BMW’s parked all over, and a line of well-to-do Italians in designer clothes stretched far out the door. It was so busy that we couldn’t get in and decided to return the next day for an early lunch. The next day we left the hotel early so that we would be sure to get a table. On the way we passed through an outdoor market and saw a crowd standing around two men. The men had a big pot of hot oil and were making fried pizza. We were only a few blocks from Da Michele, but we had to try one anyway. What if we could not get into Da Michele? We ordered a fried pizza stuffed with tomato and mozzarella and watched as one of the men flattened a disk of dough, while the other topped it with the fillings. He folded into a half moon, and dropped it into the boiling oil. A minute later, it came out crisp, brown, and delicious. When we reached Da Michele, we had no trouble getting in. The walls are white, decorated with a few framed poems and quotations about pizza. The tables were bare marble. Simplicity is what makes it special. Da Michele serves only two kinds of pizza: marinara and margherita. There is no other food. Beer, coke, or mineral water are the only drinks. When you are that focused you have to be good, and Da Michele’s pizzas are some of the best I have ever eaten. Light and tender, they seem to melt in your mouth. Each one costs only five euros. Diagonally across the street from Da Michele is Pizzeria Trianon. It has dining rooms on three or four stories, but only one has air conditioning. There are many different pizzas to choose from, though my favorite here is the Margherita DOC. 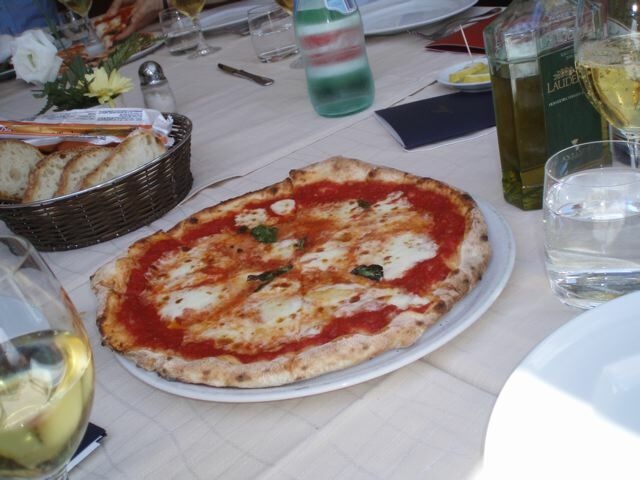 This is a type of margherita made with halved, tiny, sweet Neapolitan tomatoes known as pendolini. In each bite, you get the sweet, juicy flavor of the tomatoes combined with the tanginess of the mozzarella di bufu1a — a great combination. My wife, Michele, favors Da Ettore. Here they make great pizza and fried zucchini flowers as well as a stuffed pizza called the pagnotiello. It looks like a stuffed pita sandwich but it is made with pizza dough. Her favorite is made with fresh mozzarella, prosciutto, and arugula. Ciro a Santa Brigida was the first place I ate pizza when I fell in love with Naples and its pizza in 1995. I was gripped by a pizza frenzy and ate pizza several times a day in restaurants and while walking in the streets. This is a great place to eat pizza and to sample the classic cooking of Naples as well a fine restaurant with a good wine list. They tend to seat all the non-Neapolitans downstairs, so ask to sit upstairs for a more interesting experience. Europa is another excellent place to go for both pizza and other food. 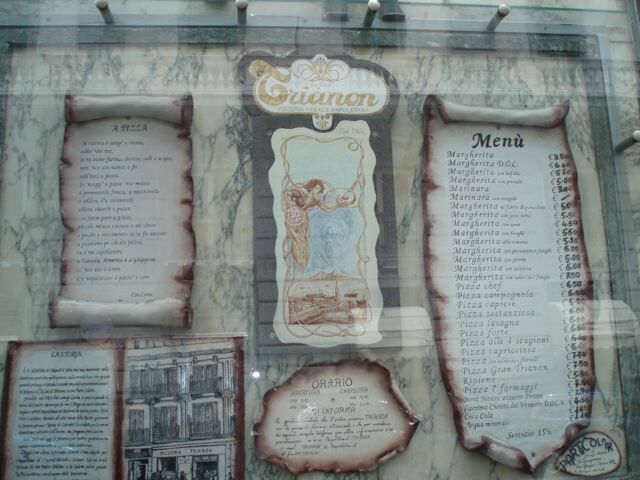 It is a bit more rustic than Ciro and we have always eaten well here. 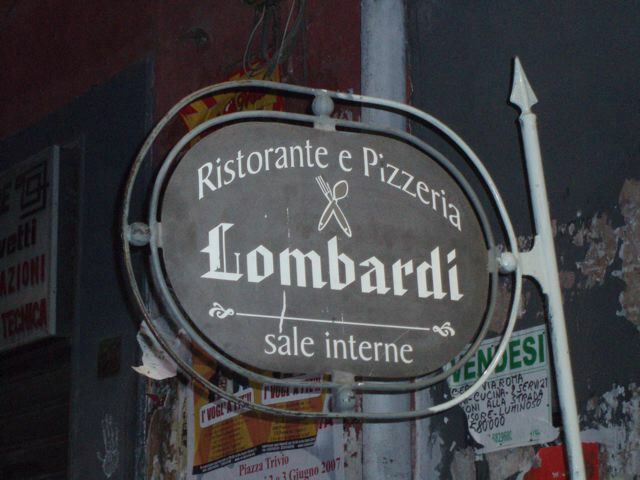 In Spaccanapoli, the old quarter in the heart of Naples, is Lombardi a Santa Chiara. Here we had a great margherita topped with prosciutto and rughetta, leaves of small wild arugula. Antica Port’ Alba has a stand in front of the restaurant. When the pizza was ready a bell would ring and people would come to buy their take-away pizza, which was folded into fourths, a portafoglio meaning like a wallet, and eaten as they walked. This pizza is a little smaller than the regular margarita. Legend has it that when the Spanish ruled Naples, Spanish soldiers ate their pizza this way so that they could hold on to their weapons with their free hand. 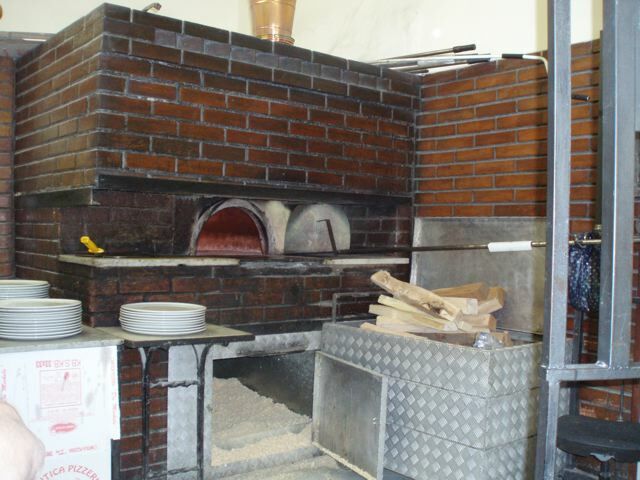 Not far from Naples in the town of Vico Equense is Da Gigino Universita’ della Pizza, better known as Pizza a Metro. Here they serve pizza by the meter and the waiters will help you to decide how many meters you need. On our first visit we ordered a Margherita. It tasted great, but I said to Michele “I tastes like prosciutto, but I don’t see any prosciutto on it.” She agreed and on the way out we stopped to watch the pizzaiolo. Michele noticed that just before sliding the pies into the oven, he drizzled a thick milky-looking liquid on them. The pizzaiolo told her it was strutto, liquified lard, which Michele remembered her mother making once a week by rendering pork fat. The pizza mystery was solved! Strutto is, or was, the quintessential Neapolitan cooking fat, though sadly, most cooks today have switched to olive oil. For a very large place that caters to enormous groups, the food at Pizza a Metro is very good. Last time we were there you could order your pizza with or without lard. On Capri, Villa Verde, not only makes delicious pizza but also great antipasto. One of the highlights was the fresh bufala mozzarella and red ripe tomatoes. 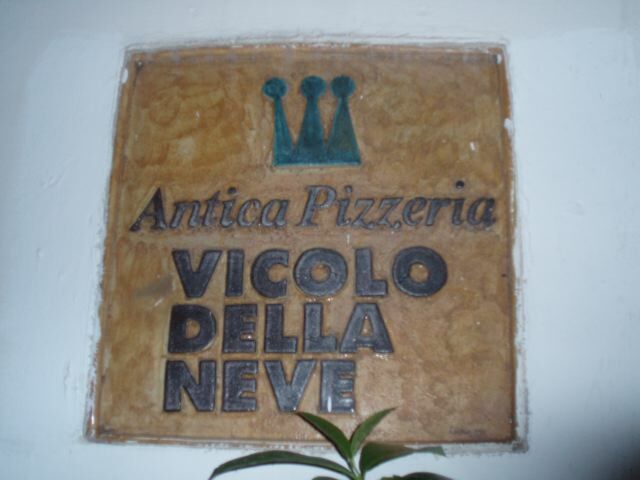 If you are in Salerno a great place for pizza is Antica Pizzeria Vicolo della Nieve. They also serve a delicious seasonal antipasto assortment. Neapolitans like to drink sparkling beverages with their pizza including beer, soda, aqua minerale gassata and sparkling wine such as the locally produced red Gragnano made from piedirosso and sciascinoso grapes. Other wine choices I like include the white Falanghina (now very popular in Rome), Asprinio di’Aversa, and Lacryma Christi del Vesuvio Bianco made from the coda di volpe grape. For red, Lacryma Christi del Vesuvio made with the piedirosso grape is my choice. When I am in NY I Iike to drink Barolo, Barbaresco, Taurasi, Chianti, Barbera , etc. with my pizza margherita. In fact since I believe that pizza margherita is the perfect food it will go with almost any wine that is not international in style- no barriques etc. The two places in NYC that I go for pizza are Keste and La Pizza Fresca. In my opinion Keste has the best Neapolitan style pizza in the city. La Pizza Fresca has good Pizza and other foods, plus a great wine list. Great post. I love the crazy energy of Naples. There is no denying that the best pizza in the world is in Naples. We were just recently there in March and really liked both Da Michele and Antica Port’Alba. Port’Alba might not have been as traditional as Da Michele, but the Port’Alba pizza, with mussels and clams still in the shell, is without a doubt, the best pizza that I’ve ever consumed. Although the crust at Da Michele should be a benchmark for pizzerias everywhere…as well as the minimalist menu. 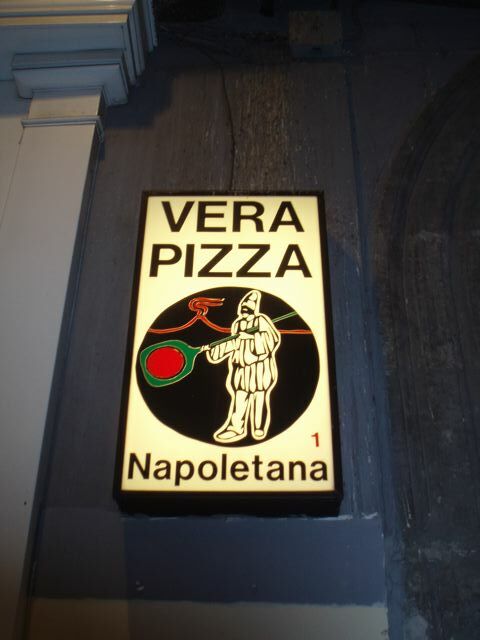 Reading about pizza in Napoli from you is like listening to the Pope speak about religion! I hope on your next trip you will have the opportunity to visit La Notizia. I’d love to know what you think of their Margherita. Thanks for the ristorante recommendations and info on cooking with lard. I’m still amazed that Da Michele uses “lesser” ingredients, such as vegetable oil rather than extra virgin olive oil and fior di latte rather than mozzarella di bufala. And ditto on Tom’s homage. oilive oil is not traditiona in Naples- lard is or was, so vegetable oil would do just as well. 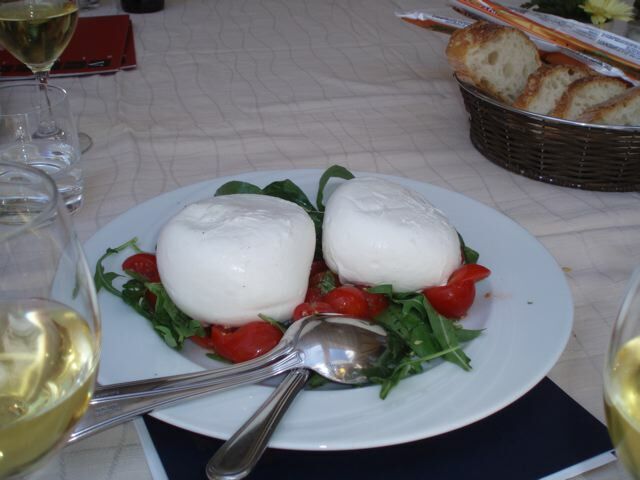 Nice point on eating mozzarella di bufala alone. I hadn’t thought of that. And I’d thought that every region of Italy had had extra virgin olive oil since the beginning of time: that’s one to investigate! Ciao Mattie- In Naples we woulds see them eating mozzarella by itself. Extra virgin olive oil is “new” to the south and lardo was what they used. L’Antica Pizzeria de Michele was the best part of my trip to Napoli. Now if only I could transport myself there whenever I have a craving! Da Michele, by far is the best in the world!!!! !